The West African Examinations Council, WAEC, has announced that the General Certificate Examination (GCE) registration for 2017 will commence on Friday 28th April, 2017. This was made known via the official twitter handle of the Council. According to the information made available, “Candidates are expected to pay a registration fee of thirteen thousand, nine hundred fifty naira N13,950 at any of the approved bank or any accredited agents to obtain the registration pin and information VCD. “Normal registration period is from Friday April 28 to June 28. After obtaining registration pin, candidates should log on to www.waeconline.org www.waeconline.org for registration. 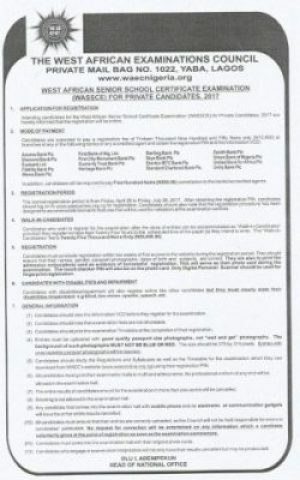 0 Response to "West African Examinations Council Announced the commencement of Waec GCE 2017 Registration"